Which Speeding Signage Scares You the Most? I was going 60 at the time, and I slowed down a little bit. It was 10:00 pm at night, and there were no construction crews on the road. Then I saw a digital sign that said, “573 tickets issued,” and I immediately slowed down. There’s something about that sign that had a more powerful impact on me than a generic speed limit sign. I’ve never gotten a speeding ticket, and I think my brain registered that number–573–as a number I didn’t want to add to. I didn’t want to be #574. So it got me thinking: What is the most effective type of signage to actually get people to slow down? The poll below lists the top 5 deterrents, and you can only choose 1. This entry was posted on Thursday, July 21st, 2016 at 11:58 pm	and is filed under poll. You can follow any responses to this entry through the RSS 2.0 feed. If I were to rank these, here’s how I really feel: (1) Parked police car; (2) Current speed; (3) # of tickets issued; (4) enforced by aircraft; (5) $ amount of fine. Realistically, a parked police car (assuming they are dealing with something else while parked) should be benign, but it gets me every time. As soon as I see the red and blue lights, I hit the brakes before I even look down to see my speed. Rationally, I feel like the current speed & # of tickets issued should be at the top of the list for me, because I know that they are always temporarily placed (and I assume they’re placed where they are for a reason). I always expect a police car to be nearby. 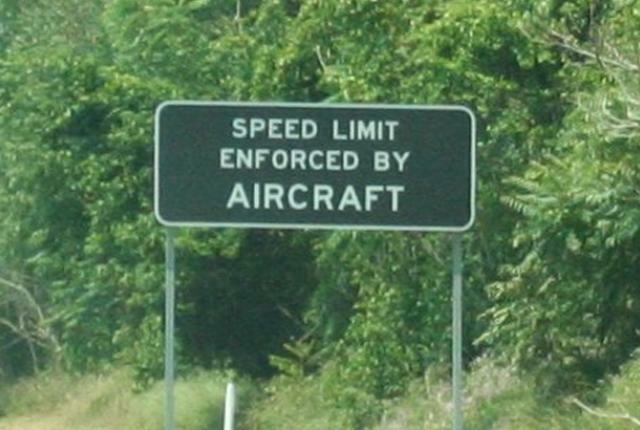 Enforced by aircraft is a real wildcard because I have no idea what that really means. Am I going to be bombed immediately if I cross over 60 mph? Is a tractor beam going to rip me from the drivers seat and pull me up into some merciless government test airship? Those signs scared the dickens out of me when they first came out (late 90s, maybe?). However, after cautiously towing the line in those areas since then and NEVER seeing a single aircraft or feeling any repercussions from exceeding the speed limit near one of those signs, I’ve now pretty much come to interpret them as “we’re not really going to police this area, but maybe this sign with make you slow down anyway”. By the way, “parked police car” with NO red and blue lights (e.g., hiding somewhere near the road) is definitely #1. When I was living in Winnipeg, someone hacked into one of the digital signs in a residential neighborhood. It used to be a generic “slow down”, they changed it to “slow the fu*k down” (without anything blocked out). Police were looking for the hacker but did mention that you could visibly see motorists slow immediately upon reading the sign!